Eight years old Samrat kept his ears close to the rail track in a bid to catch an 'unknown' noise amid sounds of impending joy and celebration. He kept struck to the rail, as his ear has sensed the slow rumbling of the track. But before he could understand what that sound really was, he was whisked away by a cop who by then had heard over his wireless set that 'it is approaching'. Samrat run straight to the platform and soon mingled into the thick crowd which flooded the Agartala Railway Station to witness 'a historic event' and then came the moment – a giant rail engine overloaded with people finally moved in to the Agartala Railway station, opening a new chapter in Tripura's glorious history. For the thousands of people who have turned up since early morning – the long wait was over. It was not a wait of a day; it was a wait of decades. For little Samrat the joy was something beyond imagination. Holding his breath, he shouted, "My Agartala now has a rail" – Samrat's joy perhaps reverberated in every one and the happiness was writ large on every face. " It is a great moment. I have no words to express my joy. In my youths, I had taken part in agitation in demand of rail, now I have grown old but I am glad that our demand is fulfilled" said Ramendra Banik, an octogenarian. This spell of joy ahead of Kharchi Puja has come in good time. Agartala has finally made it to the national rail network when the engine of Northeast Frontier railway today reached here after traversing a stretch of 68 Km between Ambassa and Agartala. The train started its journey from Swapnabari in Authamura hill ranges amid unprecedented security cover and reached Agartala around 3 PM. “Since it was a trial run so we drove the engine very slowly. We did not face any problems in the way but we stopped in all station as lot of crowd gathered everywhere to get a glimpse of the engine. I have never seen such enthusiasm before," said Narayan Dutta, one of the drivers of the engine. While Narayan was talking to reporters the other members of his crew – driver Sudhanshu Kumar Das and assistants Nabendu and Chandan got into a huddle with other railway staffs to celebrate the day. Agartala has become the second state capital in Northeast after Guwahati to have a railhead. Trains first reached Tripura in 1964 when the railway hit the North Tripura town of Dharmanagar. Later it was extended further to Kumarghat. But then it took 40 years to get the railhead to Agartala. Long sustained tribal insurgency in the state has a lot to do with it. The impetus grew more in the Manmohan Singh led UPA government at Centre with a nagging pressure from the state government. Chief Minister Manik Sarkar had been most vocal on it. This project was a Herculean challenge for the Northeast Frontier Railway. The 'human cost' of this project was enormous. As many as 36 people – attached to this project - died in nearly 28 militant attacks during work. 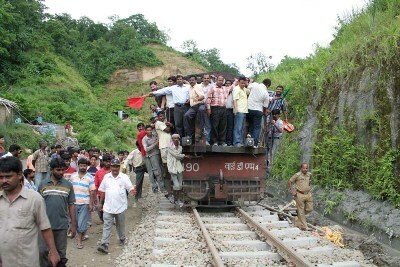 The rebels kidnapped a total of 67 people connected to this rail project and only 19 were freed after huge ransoms were paid to the ultras. “It was big task, at times it was difficult but we had only one mission – to bring the rail up to Agartala and we could do it because we got all round support." said FS Meena, Deputy Chief Engineer, Northeast Frontier Railways (Construction). The 109-km rail link between Kumarghat in North Tripura district bordering Assam and Agartala was sanctioned in 1997 by the then HD Dave Gowda government. The rough terrains and the threat of militant attack have forced the NEF Railway to carry the work of laying the tracks in a rather snail pace. Moreover big tunnels had to be cut through the Atharamura and Baramura hill ranges, which separate Agartala from Ambassa. Now that the Engine trial was successful, soon the Railway Safety and Security Board will visit the state and good train trial will be done. Once the railway Safety and Security Board gives final clearance passenger service will resume. The NEF railway is eyeing the auspicious day of 15th August to resume passenger service.